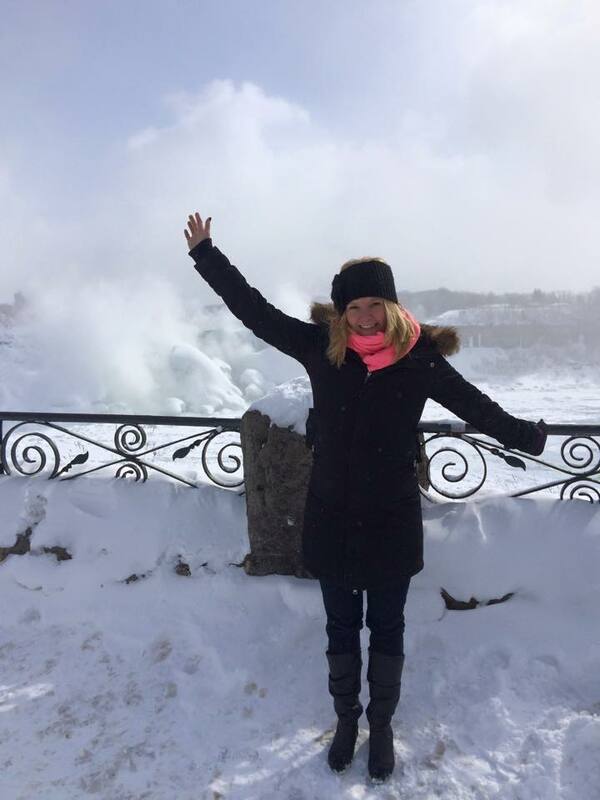 Tourists Guide to The World: Niagara Falls, ON – The Winter Edition – The Small Things. I know I’m a few days behind the times but today, I want to talk about Valentines day! I’ll give it to you straight: As a general rule I feel that valentines day is a materialistic holiday that puts all people (single, committed, in-between, ect.) in an awkward position. Usually I actively avoid this fake holiday by holing up in my room with a good movie but not this year. For Valentines day 2015 I decided to embrace the love… of my best girl friends. I love Lucas more than anything and the way things are currently going I see a long and happy relationship for us but the reality is if things ever go south, I will always have my girl friends. 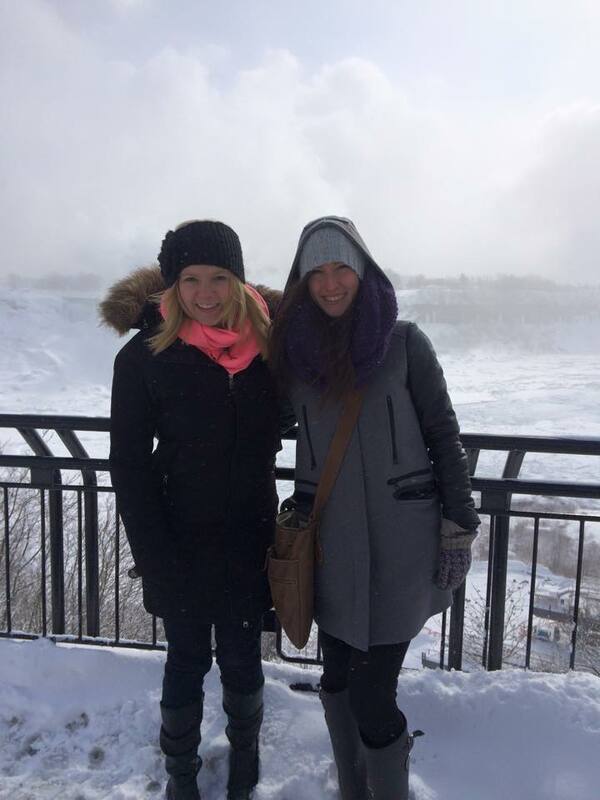 So this year we decided to celebrate Gal-entines day (get it, girl + valentines…) together by going on a road trip to Niagara Falls!! After writing Lucas an adorable card I jumped in the car with my friends & we were off! We checked into our hotel around 5:00 pm and unpacked our bags before going to dinner. We decided to drive to dinner which wasn’t the best call. The roads were incredibly snowy this weekend. I think the mist freezing as it came off the falls must have been a factor. It took us about half an hour but we eventually found a parking spot near an Italian-American Eatery called Vinny’s. The place as mostly filled with couples holding hands but that was fine with us. I got a pretty decent cream sauce pasta because you can never go wrong with cream sauce pasta. After dinner we returned to the hotel to get dressed up for our night on the town. Unsurprisingly we all ended up in mostly black outfits. I think its a winter thing. It almost feels wrong to wear bright colours when there is snow on the ground. Then our first stop for the evening was Jimmy Buffett’s Margaritaville! You guessed it! This place makes super fancy Margaritas! We all ended up getting a blue one with a really long name that I can’t remember. Think blue slushy made with tequila and you are on the right track in terms of taste. The next stop on the girls night adventure train was the casino! We went to Fallsview because it was the closest one within walking distance. That was important because it was way, way, way below freezing and it was super snowy. 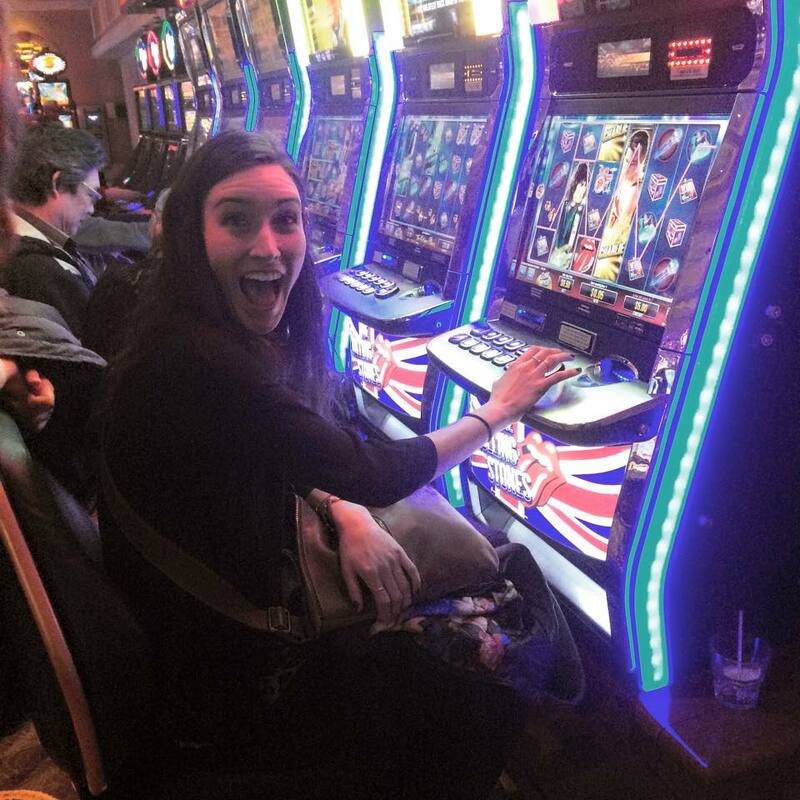 Personally, I was really excited about going to the casino. It’s not that I am super into gambling or anything, I’ve just never had the experience before. 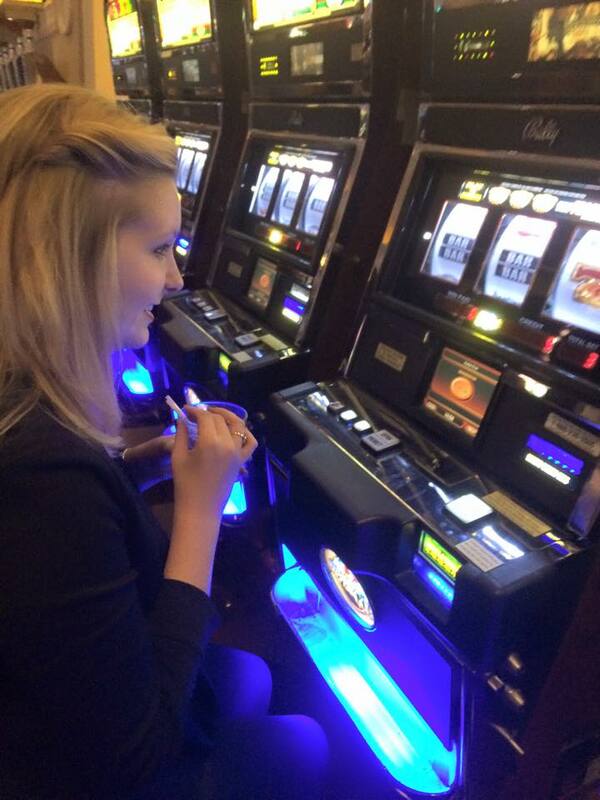 I suppose I think of visiting a Casino as a grown up right of passage. Some Most people probably find this type of atmosphere overwhelming but I really enjoyed all the lights and colours. It added to the spectacle of the whole night. We decided it was probably best if we stuck to the slot machines since none of us know how to play card games and we didn’t want to waste anyone’s time. Here is Karin and I playing on the slot machines! Apparently you aren’t allowed to take pictures in the casino but we didn’t get caught… hehehe. I played 15 dollars and sadly didn’t win anything. Stacey played 5 dollars and won $4.50. Mel played 5 dollars and made $6. And Karin was the big winner of the night, she played 10 dollars and won $25! As fun as it was I don’t think any of us will be returning to the casino anytime soon. There were some people there with cards loaded with money and they just sat there, plugged into the machine, pressing the button over and over and over again. To be honest it was quite sad and depressing if you really thought about it. But for one night out with the girls it was a lot of fun! After that we attempted to go to a nightclub for some dancing but it was last call by the time we got there. Time really does fly inside the casino. So we ended up back at the hotel around 3 am and then we ordered some cheese pizza. All in all it was a great way to end the night. The next morning we had an all american meal at IHOP. Let me tell you something about IHOP. This is not something we have in Canada… I mean we do, beside the Falls but it is a very Americanized piece of Canada. Nowhere else will you find an IHOP. I was really excited for some Pancakes from the international house of pancakes but sadly I was sorely disappointed. Everything tasted extremely processed and unnatural. Next time I’m in Niagara I think I’ll stick with some all Canadian Tim Horton’s for breakfast instead. After breakfast we went to the Falls! Despite the extremely cold temperatures I had a great time! The last time I visited the Falls I was only 5 and I have virtually no recollection of this trip. So it essentially felt like the first time for me. I think seeing the Falls in their frozen state was an interesting treat. The water was still flowing but there was a thick layer of ice covering the boulders at the bottom. Add the white mist and it looked like a magic potion that had bubbled up. 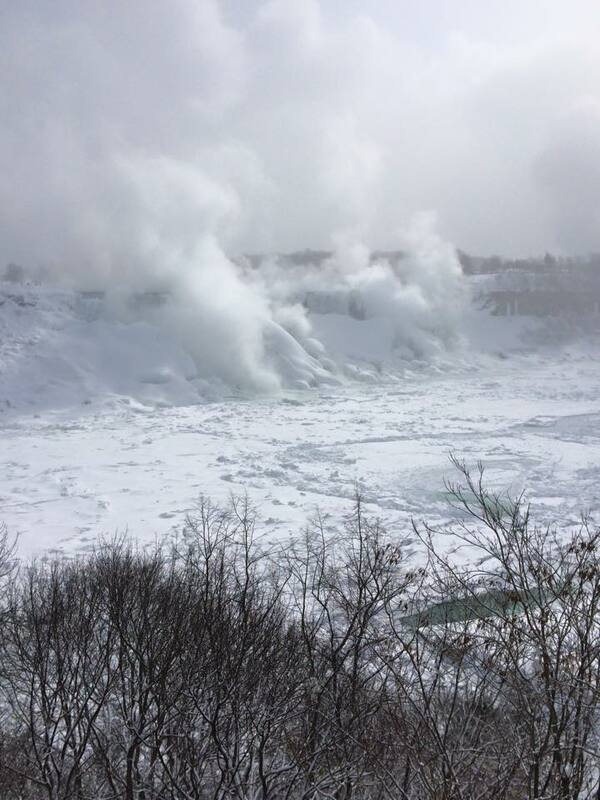 The American side of the Falls had a lot more frozen chunks, whereas the the Canadian side seemed to be flowing more freely. You can’t really see anything that well in the pictures, but trust me. It was cool. I definitely plan on returning in the summer months to see the Falls flowing in all their glory. Finally, our last stop was Clifton Hill!! This is where all of the entertainment attractions are. You know, restaurants, mini-putt, laser tag, wax museums, chocolate shops, ect. We didn’t have the money to do it all so we decided to do the thing that we can’t do at home. A wax museum! We went to MovieLand. So named because it was filled with wax recreations of movie stars. Not all the statues looked like their celebrity counterpart, but most of them still looked eerily real. Check out some of my Favourites below! Well that just about sums up my valentines day weekend! How did you celebrate the day of love? With a S.O. or with friends? Share in the comments! Thanks Millie. Definitely a weekend filled with excellent memories. And yes, it was a much needed break from reality for sure! Thanks for reading! What a perfect celebration!! I went to dinner and a movie with my gal pal and we had a blast! What movie did you and your friend see? I think girls weekends over valentines day might become a tradition for me and my friends, hopefully! ……. 50 shades ……. 🙂 HAHA.